A new page has been published in the story So! You’d Like to See Retropolis: a Visitor’s Guide to the Future That Never Was, at Thrilling Tales of the Downright Unusual. Today marks the end of The Lair of the Clockwork Book at Thrilling Tales of the Downright Unusual. It’s been a long ride and I hope it was worth the price of admission, which is a pretty safe bet seeing as how it was free. Unless you’ve bought the book, of course, which makes you My Hero. Speaking of the book, the Kickstarter hardcover edition is chugging along. I have to finish reviewing the (beautiful!) proof today and I haven’t heard anything new about the die for the cover stamp, but we’re making progress. The full color paperback edition is already available. I’ve completed my short list of changes for the Thrilling Tales site: it’s all ready now for its Intermission. That will start up on Thursday and it’ll run through the summer while I try to get ahead of you, both on Part Two of The Toaster With TWO BRAINS and on the next Real Serial..
I’ve got a lot of preparation done for that next serial. (I even have a working title now!) 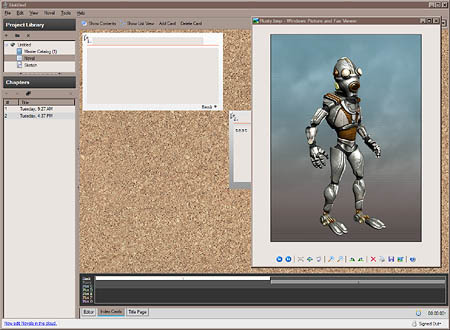 I’m setting this project up with Celtx. I was a little nervous about its proprietary format, given the limited number of ways you can export a project, but eventually I realized that whether it’s for the web or the print version I always just copy and paste anyhow. I do like its systems for adding notes and creating character descriptions, including images, and the index card system and Plot View look like they’re going to be pretty useful for me. I’ve picked up a refurbished Thinkpad so that I can realize my years-long ambition of writing out on the porch during fine weather… which we suddenly don’t have. The laptop remained a good deal even after I replaced a couple of missing things, but between you and me and the entire Internet it was still quite an extravagance. For me, I mean. So I hope you’ve enjoyed The Lair of the Clockwork Book, and that you’ll think about buying it in print; and I hope you’ll also get a kick out of the upcoming Intermission. In the meantime I’ll be busy working on the things you’ll see after that summer-long feature concludes. For my part I’m looking forward to a somewhat more relaxed schedule. I should be able to get all caught up on TWO BRAINS and still have plenty of serial pages for you to enjoy, and maybe even get another thing or two done along the way. That, anyway, is The Plan. 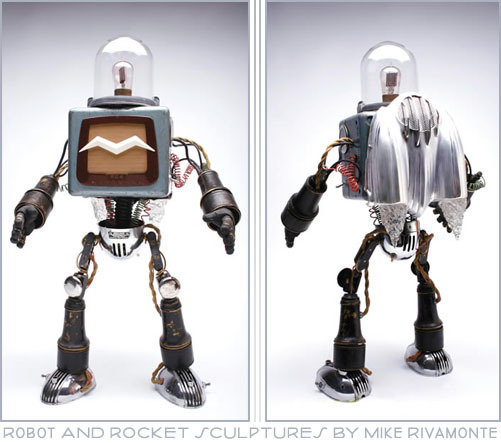 Mike Rivamonte’s assemblage sculpture: Robots! Rockets! Speaker Grilles! There’s just something about assemblage sculpture of robots, in which the artist picks from the cast-off streamlined spare parts of yesterday and makes something entirely original – though not entirely new – out of those old gauges, speaker grilles, canisters and vacuum tubes. Like I say, there’s just something about them and that something never fails to make me smile. So thanks to Dark Roasted Blend I’ve been smiling this morning. These are just a couple of pictures of Mike Rivamonte’s assemblage sculptures. My favorite listed component (so far!) is "Australian drive-in speaker". 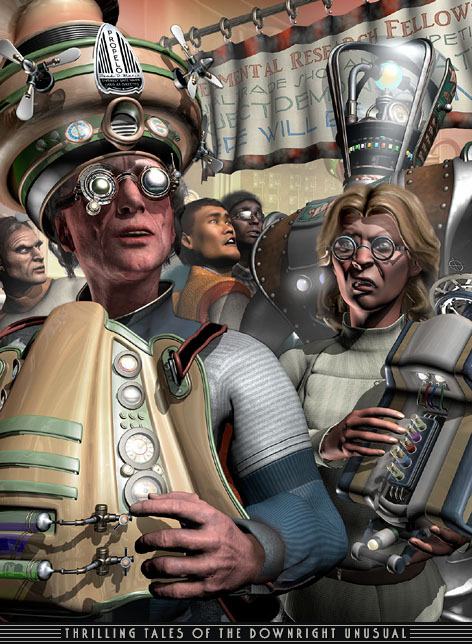 Because the dedicated roboticist will go straight to the Antipodes for his diodes. There are also rockets, including some resin-cast versions, listed on Rivamonte’s home page, and for those of us with more appreciation than ready cash there are some awfully nice prints, too. Wonderful stuff!